Zamioculas zamiifolia, commonly known as the ZZ plant, is an evergreen flowering plant native to eastern Africa. It was discovered in the 1800's but only gained popularity in recent years. Now, it is one of the most popular indoor plants in the world. It received its name from the fact that it looks similar to a Zamia palm which comes from Central America, but is not related to it. Besides its attractive appearance, the main reasons it is so popular are its low maintenance requirements and its ability to grow even when neglected. So if you are traveling a lot, or just very forgetful when it comes to plant care, read on, because you'll hardly find a plant that is this easy to maintain. This plant is extremely hardy, and can easily survive in poor conditions. It contains high levels of water in the leaves, which is one of the reasons it does well in low light and can live for up to four months without water. However, if you water your ZZ plant regularly and place it in a bright spot, it will be able to grow to its full splendor. The plant is recognized for wide, fleshy, glossy leaves that grow out of the thick stems. The stems usually grow upwards, but some might arch over. Zamioculas zamiifolia is commonly mistaken for a fake plant because the shiny leaves give it a plastic appearance. ZZ plant also has an interesting looking root system. You will notice potato-like rhizomes above the soil. The rhizome stores water until the next watering, which is why you should never overwater this plant. When its grown outside, it also develops small yellow flowers, which are usually partially hidden between the leaves. 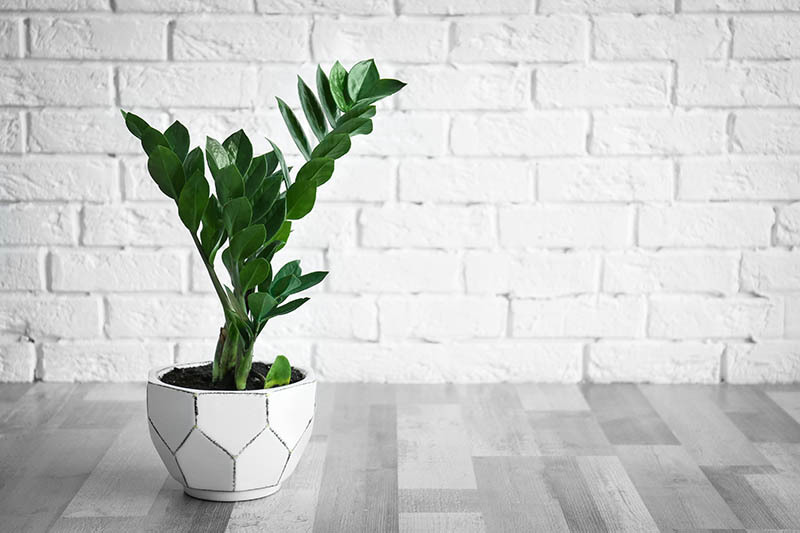 This plant is very trendy and will fit perfectly in any house or office, whether it is a traditional or a modern setting. The main disadvantage of this plant is that it grows slowly and sometimes doesn't grow at all. Although this doesn't bother most gardeners, some people like to see changes in their plants. On the bright side, it is very simple to propagate it, so you'll be able to grow your own plants easily and share them with your friends and family. And because this plant is so easy to maintain, it's a perfect gift even for people who usually aren't plant enthusiasts. 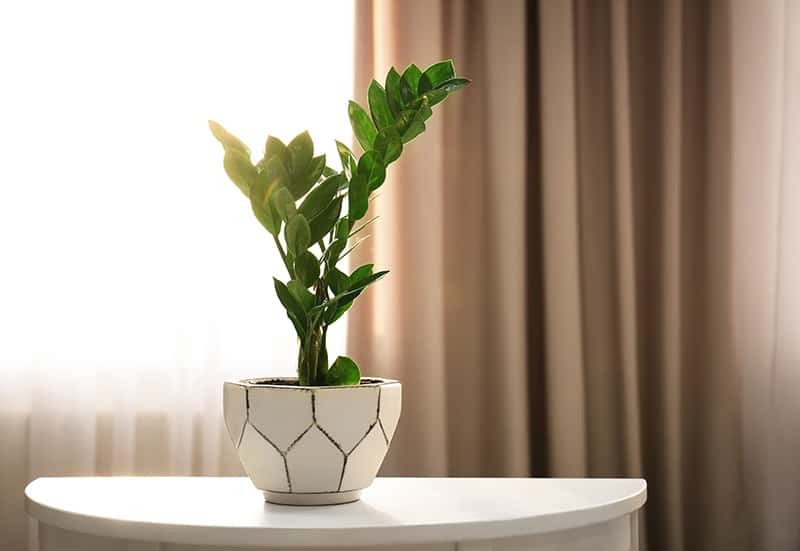 According to a study from the University of Copenhagen, Zamioculcas zamiifolia has air purifying properties in indoor environments. It is successful in removing benzene, toluene, and some other chemical compounds from the air. Aside from the easy maintenance, this is also a common reason why the ZZ plant is a popular choice in office spaces. The roots and leaves of this plant are traditionally used to treat ulceration, earache, and some inflammatory conditions in Tanzania. Because this plant is poisonous when digested, all these treatments are topical. Z. zamiifolia is the only plant belonging to the Zamioculcas genus of the family Araceae. You will usually find this plant only in its regular, green variety. If you are lucky, though, you might find some other varieties, including the following. Average room temperature between 60-75°F is good, but it will grow faster in warmer conditions. Avoid temperatures below 45°F. Water the plant thoroughly, and let the soil completely dry out before watering again. Most likely, you will water it once in a few weeks, depending on the area you live in. Warmer temperatures and bright light require more water, but still, make sure the soil is never soggy. The most common issues this plant faces are a result of overwatering, and this includes stem and rhizome rot. This plant can tolerate periods of drought, but it will drop its leaves if left dry for too long. It's a survival technique that the ZZ plant uses to conserve moisture, and if this happens, simply water your plant again and it will grow its leaves back in no time. The plant will be healthiest if it grows in bright and indirect sunlight. You can put it in the morning sun, but cover it in the afternoon because the harsh sunlight will likely burn its leaves. One of the reasons you will love this plant is because it also tolerates low light conditions. This will slow down its growth, but won't harm it in any way. The plant will also grow under fluorescent lights, so it is a common choice for offices. The best choice would be a well-draining cactus potting mix. Add some perlite or sand to the mix to maximize the drainage. It is necessary that the pot has good drainage holes at the bottom to avoid any water retention. Too much water causes the roots to rot. Zamioculcas zamiifolia doesn't need much fertilizer. This plant does grow slowly, so if you want to maximize its growth, use a diluted liquid fertilizer once per month, but do so only during the growing season. The best time to fertilize is after watering as this will prevent the fertilizer from burning the plant. 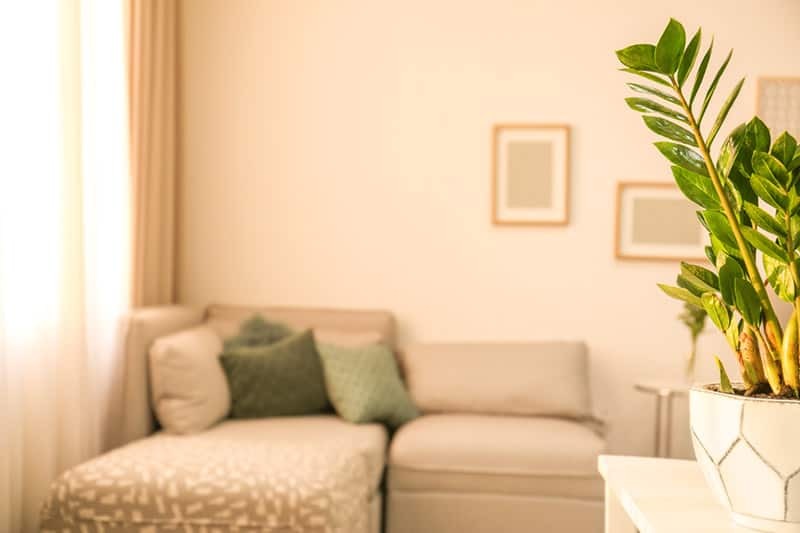 Average house humidity will be fine with this plant, but you might have to increase it in the winter if the heating in your home makes the air too dry. You will notice the humidity is low if the leaf tips turn brown. It is fairly easy to propagate the ZZ plant. Just cut a leaf off the stem, allow it to dry for a few hours, and place it in water or moist soil. Don't put it too deep in the potting medium because it could rot. Only a few centimeters of the leave should be in the soil. Keep it in a warm place and water it occasionally. After you do this, be patient because roots usually need a few months to develop, and in some cases, the first roots will appear after a year. If the leaf dies, check if there are any tubers on the bottom. If there are some, return it to the soil, since they could push new growth. On the other hand, if there are no tubers, then you will have to repeat the process with a new leaf. This happens sometimes and should not discourage you to try again. If you want a faster option, then propagate through the division of the rhizomes. To do this, take the plant gently out of the pot, separate the rhizomes, and place them in their individual pots. This video does a good job of explaining how to propagate the ZZ plant in water. In the first five years, when the plant is still young, re-pot it once every spring. You don't need to re-pot it regularly after that period. Do so only if the roots outgrow the pot. The plant does not need regular pruning. Just cut away any yellow leaves close to the base of the stem. If one stem grows significantly more than the others, the best choice is to cut the stem completely. If you shorten it only, it might look unappealing. This plant has almost complete resistance to all pests and diseases, and most likely, you will never have any issues. This makes caring for the ZZ plant even easier. Diseases might infect your plant only if the humidity is too high or you are watering it too much, so make sure you have these things under control if you want to avoid any issues. In rare cases, aphids could infest your plant. This is more likely if your plant is outside in the warm summer months. Aphids can be hard to get rid of and can spread diseases. If you notice random yellow spots on the leaves of your ZZ plant, check if you can see any aphids on it. It can be difficult to identify them since they are tiny and well camouflaged. Therefore, also look for the sticky fluid they leave behind after feeding. After you've identified the aphids, mix a weak solution of liquid soap and water and spray it on the plant. Wait a little while, then wash everything off with clean water. Cut out any diseased leaves to stop the infestation from spreading. Is the ZZ plant poisonous? There were some rumors that this plant is cancerogenic, but recent studies have debunked this theory. However, this plant contains calcium oxalate, which is toxic to both humans and pets. So keep it out of the reach of curious children and pets. The poison isn't fatal, but it could cause diarrhea and vomiting. Also, if you have sensitive skin, the leaf juice could cause irritation. Can I use leaf shine products on this plant? No, you should never use leaf shine on this plant because it has naturally waxy and shiny leaves. However, you can occasionally wipe the leaves with a damp cloth to clear off any dust. What should I do if the stems of my Zamiculcas zamiifolia are drooping? This could happen for a number of reasons, including both over and under watering. If you think this is not the case with your plant, feed it with some fertilizer or try placing it in spot with more light. If a branch breaks off my ZZ plant, can I use it to propagate a new plant? You can. Put the branch into moist soil or water, but be prepared with the knowledge that it takes a lot of time for this plant to develop new roots. My plant isn't growing at all. What should I do? Slow growth is the main disadvantage of this plant. Sometimes, it seems not to grow at all. This is usually due to three main factors: water, light, and temperature. Adjust these factors according to the information provided above, and you can expect your ZZ plant to start growing. Be patient though, because growth will take at least a few weeks even after you've perfected all the conditions. Why did the leaves of my ZZ plant drop? Leaf drop is usually a survival instinct resulting from prolonged underwatering. Start watering again, and the plant should be fine within a few weeks. On the other side, if you are sure the soil isn't dry, it will most likely be because of overwatering, and usually means the rooting system started to rot. There is not much you can do when it comes to this point, so consider propagating the plant before it completely dies. What should I do if my ZZ plant grows unevenly? 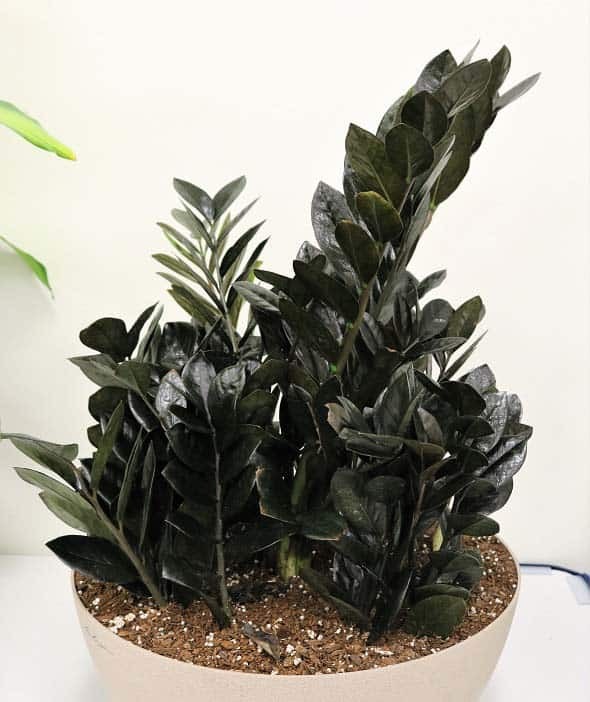 Zamioculcas zamiifolia grows toward the sun, so you should turn it with each watering to even out its growth. If one stem seems arched or longer than the others, consider pruning it to achieve a more even look. Too much "care," meaning overwatering and overfeeding, is the only reason why this plant usually dies off. So, if you are a person who likes to spend a lot of effort and time with your plants, maybe ZZ plant is not the best choice for you. But let's be honest; among all the plants that require specific conditions and tons of care, having a plant that will stay green even if neglected might be a relief for every gardener. 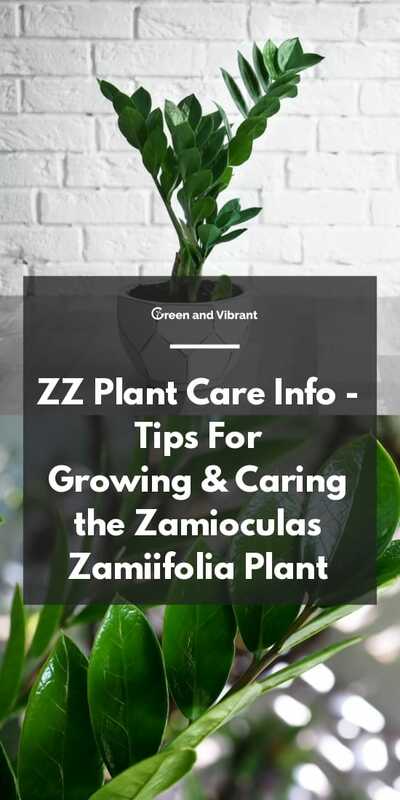 ZZ plant enjoys room temperature, needs little watering, can survive in different light conditions, is almost immune to all pests and diseases, and is easy to propagate. It also looks very attractive and will enhance the decor of any space. These features combined make it almost perfect, especially for people who don't want to put too much effort into their plants.